Nikola Tesla was born around midnight, between July 9 and July 10, 1856 during a fierce lightning storm. To family legend, midway through the birth, the midwife wrung her hands and declared the lightning a bad omen. This child will be a child of darkness, she said. 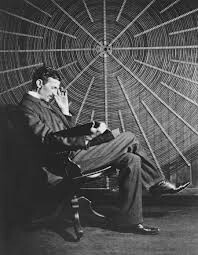 Tesla could not stand the sight of pearls, to the extent that he refused to speak to women wearing them. When his secretary wore pearl jewelry, he sent her home for the day. No one knows why he had such an aversion, Tesla had a very particular sense of style and aesthetics, He wore white gloves to dinner every night and prided himself on being a "dapper dresser." Himself reading in his lab chair. I must be electrifying to people. 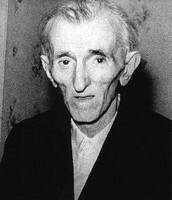 Nikola Tesla as an old man. Many have characterized Tesla and inventor Thomas Edison as enemies (seethis and this,) but Carlson says this relationship has been misrepresented. 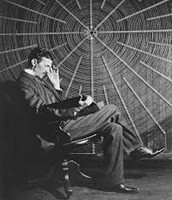 Early in his career, Tesla worked for Edison, designing direct current generators, but famously quit to pursue his own project: the alternating current induction motor.In a conference where Tesla was speaking. Edison, hard of hearing and not wanting to be spotted, slipped into the back of the auditorium to listen to the lecture. 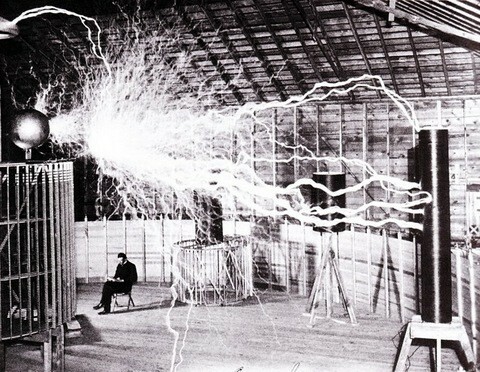 But Tesla spotted Edison in the crowd, called attention to him and led the audience in giving him a standing ovation.